I am very thankful that Family Friendly Gaming was able to purchase Trackmania Turbo on the Xbox One. I like this racing game even though I am not very good at it. I can usually get a bronze medal in the courses in Trackmania Turbo. Others had to get the silver and gold medals. In fact that is one of the short comings in Trackmania Turbo. If you can not get silver in every race then you can not unlock certain levels. The same goes for gold. I find it sad that the PR and Marketing for Ubisoft failed Family Friendly Gaming so miserably. Are they discriminating against us because we obey God? Trackmania Turbo has its flaws. The crazy tracks and insane crashes are part of the game. Trackmania Turbo taught me to be reckless. Trackmania Turbo also taught me to do things faster. Which led to many mistakes, and a lot of real world frustration. Two drivers controlling one car cooperatively was actually a neat and cool mode that families can get into. Trackmania Turbo also contains those despised online game modes. I do not mess with them because they swallow too much Internet usage, and because it costs so much money for Internet bandwidth. 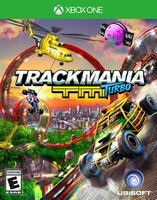 Look for my review of Trackmania Turbo to appear in issue #108 of the always amazing Family Friendly Gaming e-magazine.